The early morning sun shines on the Esmond 2 site. The 50-acre Esmond preserve contains two sites, known as Esmond 2 and 3, that date from the Late Archaic to the Early to Middle Woodland periods (3000 B.C. – 1000 A.D.). The sites were originally discovered in 2005 during a shovel-test survey done in advance of a residential development project. 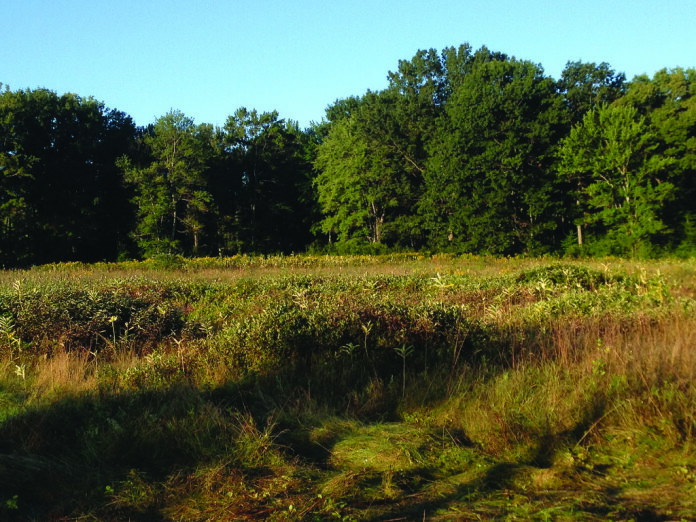 In addition to the archaeological sites, the property, which is located in the Town of Malta in eastern New York, contains associated wetlands, and the development was under review by several government agencies who recommended preserving as much of the sites and associated wetlands as possible. The property was then donated to the Conservancy by the owners Thomas P. Deveno and Thomas J. Farone. Archaeological testing has identified the Esmond 2 site as a habitation area containing features and artifacts from the Late Archaic to the Middle Woodland periods, complete with Woodland period ceramic pottery fragments. The Esmond 3 site’s abundance of lithic material, including a significant amount of debitage and discarded broken projectile point preforms, indicates that it was a lithic workshop. Adam Luscier of Hartgen Archeological Associates, Inc., and Edward Curtin all played an important role in this acquisition. American Archaeology is available on Newsstands and at Bookstores, Subscriptions are available by becoming a Member of the Archaeological Conservancy for an annual Donation of $25 dollars or more.